or contact call811.com. Give them the required amount of time to come out and locate your utilities. If you dig without having the site located, and you hit an underground utility you might be liable for the cost of the repairs (you may also get badly hurt or worse). Pay attention when you dig near the marks. Most services (power lines, cable, gas, water) will be well below the surface, but you can’t be sure, and it’s important to be cautious. They won’t locate the electric wire or gas line that goes to your street side lamp post or the water lines of your in-ground sprinkler system. If the area you hope to plant is filled with trees or shrubs, dig them out or have them cut down, and the roots ground out. You can then remove whatever grass is there. Take a garden hose and lay it out in a pleasing form. Mark the edge with white sand, lime, or a can of marker paint applied several inches outside of the line. Take your garden spade or shovel and dig out the line, angle your cut towards the bed. There are several techniques to starting a garden bed if it’s currently part of your lawn. If you have good upper body strength and it’s going to be a small bed you can remove the sod by hand with a spade and shovel. If you have bare spots in your lawn this is a great time to fill them. Remove some dirt from the area where you want to add sod, transfer your sod piece to the newly dug hole, tamp down and water. Don’t forget to water frequently until the sod becomes established. Small pieces will dry out quickly. 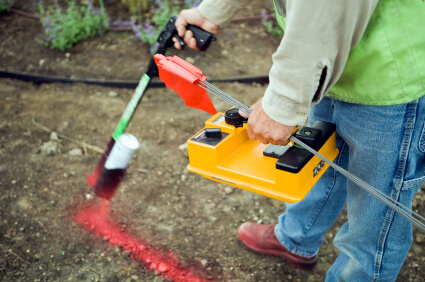 A sod cutter is the best solution for creating medium to large planting beds. You can rent this from your local big box do-it-yourself (DIY) store. You’ll need a truck and a couple of strong friends to lift it in and out. Make sure to set the blade low enough to get the roots. Sod cutters do a beautiful job of removing the sod, but they’re heavy and difficult to handle. The strong friends will come in handy here as well. The sod can be used to fill holes, hauled away, or put in your compost bed to decay. A third possibility is to apply a chemical herbicide. Roundup is my choice. You must not use it near water that contains aquatic life as they are sensitive to this herbicide. It has a temperature window of effectiveness and won’t work if the weather is too cool. It works best when the grass, weeds, and other undesirable plants are actively growing. Don’t use it on a windy day. Overspray can be a problem even on a day that’s not windy, and it will kill the plants you want just as well at the ones you don’t. The advantages of using Roundup are that it breaks down rapidly in the soil, and it kills plants to the root, usually within 24 hours. The grass won’t yellow up immediately, but you can assume that it’s dead. Make sure that you read the directions carefully and follow all safety precautions. Protect the desirable plants or lawn as you spray by having someone hold a large sheet of cardboard to shield them. You can smother the grass with either a black plastic sheet or an organic topping. Either of these techniques will take a while, but if you plan ahead, you may find that one of them is the right solution and less likely to harm the environment. You can find the plastic in rolls in the paint section of your local big box hardware store. Lay it out where you intend to plant your new bed. Cut it to shape and weigh it down with rocks, then poke holes in any depressed areas with a stick. After it rains, go back and poke holes again where the water has collected. Keep an eye on it. You could easily create a mosquito breeding ground if you’re not careful. Three to six months later lift it up and add compost and amendments. An alternative is to cover the area with 2 or 3 thicknesses of b/w newspaper, cover this with mulched leaves, garden trimmings, straw (not hay it has seeds), or compost and leave this over the winter or summer. When you are ready to plant, just dig it all in. You have cleared the garden bed and improved the soil with organic matter at the same time. When you removed the sod, you also removed some soil and have now created a depression that you need to refill. Spread topsoil, compost, and fertilizer evenly over the area and mix with a shovel or rake. You can purchase these in bags if there isn’t a lot of area to cover, or you can have it hauled in and dumped in your driveway or on the street. It will settle about 1/4 to 1/3 its depth over time. Take that into account when you are estimating the amount you need. Overfilling the garden bed by 5 to 6 inches beyond what’s needed will give a little “pouf” to the area that helps emphasize the plantings. Once you have added the topsoil, compost, and fertilizer and mixed them with a shovel, the bed should be tilled or turned to a depth of at least 6″ to incorporate the untouched soil into the new mix. Mixing the old and new soil will help water percolate through the soil properly. You’re ready to plant, edge, and much!